The teaching of German in Australia has a very long history, and for many years was a church activity. The German Saturday School is no exception, and its origins data back some 160 years when the East Melbourne Lutheran church began to teach German to the local community. The following photo dates from 1870. 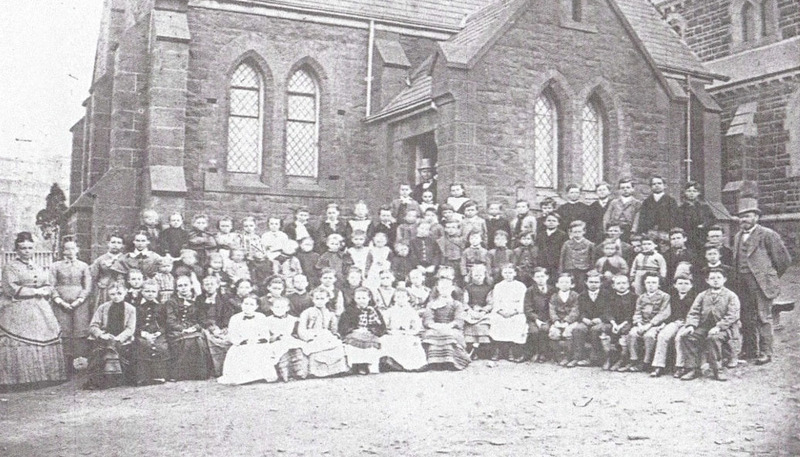 Teachers and Students of the East Melbourne School in the churchyard in front of the school hall, c. 1870s. The more recent history of the school began in 1975 with the former principal Anneliese Druskat. She initially started with a small number of students, and over the next 20 years the great commitment and input she gave as the head of the school resulted in 130 students in 1993/94 spread over two sites, East Melbourne and Boronia. Since 1992 the school has been administered and organised by a parents’ commitee. It is also recognised and accredited by the Victorian Department of Education and Early Childhood Development and is financially supported as an ‘ethnic school’. The school has been located at the Clifton Hill Primary School since 1999, and these premises provide plenty of space for students and teachers and offer diverse and creative learning opportunities both indoors and outdoors. The number of students has grown steadily during the last three years with over 180 students now enrolled. In October 2009 the following history was penned in German by the principal of the time, Sigrid Erdt. Study finds Germans fit the ideal. Germans in Australia are industrious, better educated than the rest of society and marry outside their community more than any other ethnic groups. They also integrate well into Australian life, embrace many of our cultural practices and are highly proficient in English. German settlers are often perceived as the ideal immigrants. Germans have been in Australia since the first days of European settlement and their contribution had been highly significant. The ambition of German immigrants was not only to integrate as quickly as possible, but also to preserve and nurture their native language and culture. The first German immigrants, who arrived between 1849 and 1851 in Port Phillip Bay, were in most instances Lutheran and from Prussia. Naturally they desired to hold their church services in their native language. Trinity Church in East Melbourne established a Lutheran School on the 4th of September 1854 for German immigrants’ children to ensure they would be able to follow the church service and retain their mother language. In the beginning the School had 40 students. In 1859 Pastor Goethe founded a German-English School which, due to guaranteed regular attendance of 30 students, received financial support from the Victorian Government. A school committee was elected from the congregation members. They were in charge of the selection of teachers and determined school fees as well as the teachers’ wages. The curriculum was mainly based on Prussian school regulations. Religious education was taught six hours a week, reading and writing were taught 12 hours a week in the German language and 10 hours a week in the English language. The curriculum also contained mathematics, German history and biology. The school fees were nine pence per week. As there were initially only 20 students, it was not feasible to construct a school building next to the church. However, in 1864 a hall was erected on the south side of the church, where the students were taught from here onwards. Between 1850 and 1860 German-English schools in Westgarth Town (Neu Mecklinburg), Bendigo, Ballarat and Doncaster were founded. In 1873 those schools were closed due to school enrolments dropping immensely as a result of growth in the free government school system. The first German Saturday School was established in 1899 due to consistent demand from congregation members. 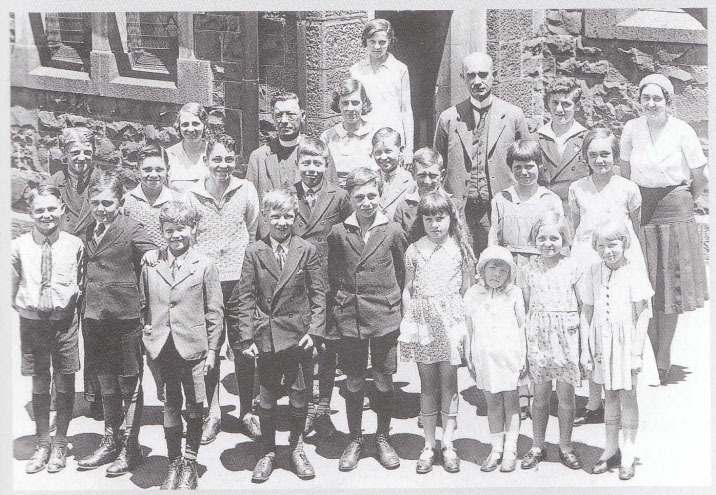 Although the German school association was not directly connected with Trinity Church, most incumbents were congregational members who set a high value on the continuance and existence of the German Saturday School. The parish council supported the school by paying a yearly membership fee. Lessons were taught Saturdays from 10am to 12pm. The school leased rooms at the ‘Model State School’ in Spring Street. Later the German Saturday School moved to the ‘State School in Rathdowne Street, Carlton’. Shortly after the Beginning of the First World War the school had to be closed. After 1925, immigration for German citizens was re-opened. Many immigrants received advice and support from Pastor Frank and his wife. Pastor Frank taught English in the evenings and reestablished a Saturday school. After the death of Pastor Frank on the 21st of October 1934 at the age of 59 years, Pastor Ewald Steiniger took over as the Parish Pastor. Henceforth he led the German Saturday School and lessons were taught between 10am and 12pm. It is not known how long the school operated; presumably the school had to be closed at the beginning of the Second World War. Pastor Seyler (1964-1974) re-established the German Saturday School as it was commonly requested by the congregation. For 20 years the school developed as a church school, though over the years students of other religious denominations were also accepted. The present history of the Saturday School started 1975 under the leadership of Anneliese Druskat, who tirelessly worked for the success and continuance of the school. At this time as well as the school in the city there was a campus in Boronia and overall 130 students were enrolled. Up to 1992 the German Saturday School had ties with Trinity Church. After that the school became financially independent and negotiated a lease with the church although only a few years later the church building couldn’t accommodate the rapidly rising numbers of students. For the last 10 years the German Saturday School has been leasing rooms at Clifton Hill Primary School for teaching purposes. At the moment 130 students between the ages of 4-17 years are enrolled. Currently there are 10 teachers and three assistants who are employed at the school. Lessons are taught on Saturdays from 9-11.30am and the committee is responsible for administration. The school is financed by school fees and subsidies from the department for education. In 1996 seven Saturday Schools belonged to the ‘Deutscher Sprachverein’ (German language association). Due to low enrolment numbers four of these closed. Now alongside the German Saturday School in Clifton Hill, ‘Templerschule’ in Boronia/ Bayswater and ‘Templerschule’ in Bentleigh/ Moorabbin persist. The latter two have an after school program to teach German after day school during the week. These three schools are members of the ‘Deutscher Sprachverein’ and hold a meeting once a term. German Saturday School has an extensive website on the internet. Images reproduced with kind permission of the Historical Society for Trinity German Lutheran Church.